Step 1: Lanuch the AngelSimTM Program. Step 2: Load the Audio Sounds. 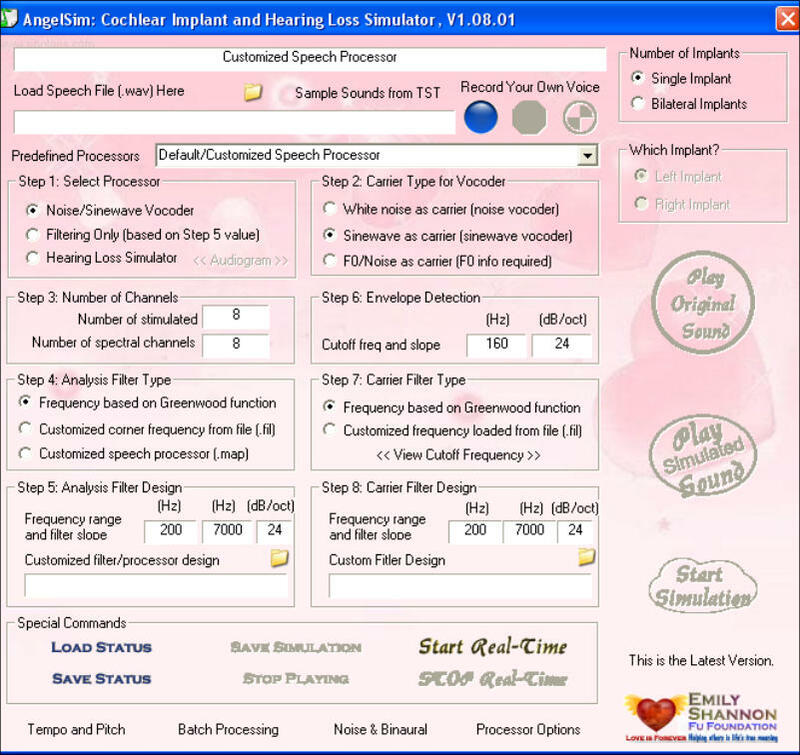 Step 3: Select the Speech Processing Strategies. 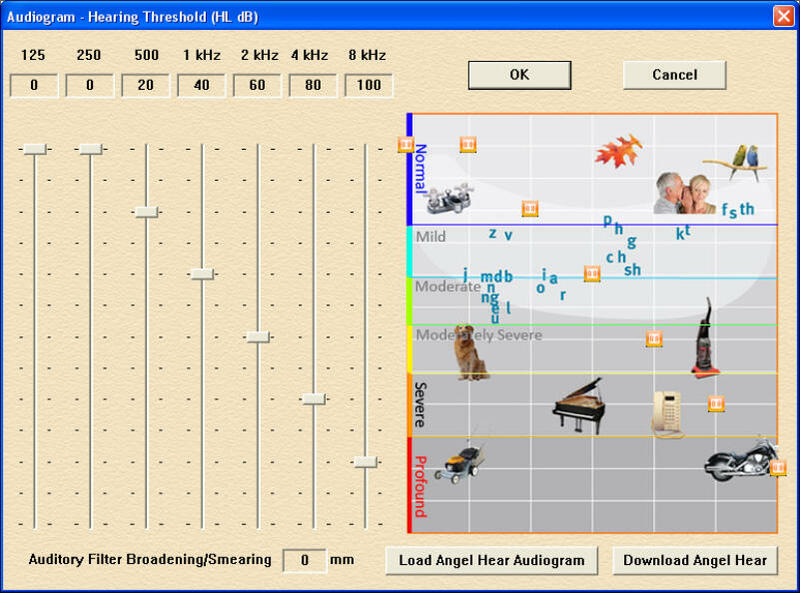 Step 4: Process the Audio Sounds Based on Selected Strategies. Step 5: Listen to Original and Processing Sounds. Step 6: Tips and Others. 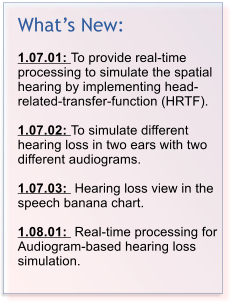 In the latest cochlear implant speech processors, speech signals are bandpassed into several frequency bands, the temporal envelope in each frequency band will be extracted by rectifcation and lowpass filtering. The extracted acoustic amplitude will be converted to electric current by a power function or logrithmic function. The electric current will be delivered to implanted electrode located in the cochlea. Noise vocoder or sinewave vocoder provides important tool to understand the effects of speech processor paramters on speech performance in normal-hearing listeners. The implementation of noise/sinewave vocoder is described as follows. 1. 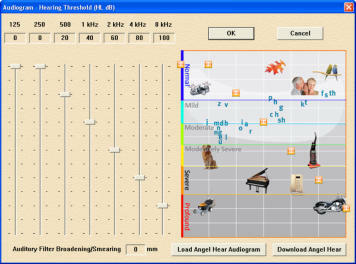 The speech signals are bandpassed into the several frequency channels. The adjustable parameter includes the number of frequency channels. 2. The temporal envelope is extracted in each frequency band by half-rectification and low-pass filtering. The adjustable parameters include the cutoff frequency and slope of lowpass filtering. 3. The extracted envelope is used to modulate a wide-band white noise, which is then filtered with a bandpass filter. The adjustable parameters includes the corner frequencies and the slopes of the bandpass filters. Adjusting these parameter can effectively simulate the spectral shifting by shallow inserton depth and spectral smearing by channel interaction. 4. The modulated noise bands are then summed and the speech level will be adjusted. 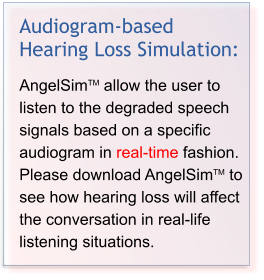 This hearing loss simulator allows to simulate the hearing loss based on the measured hearing threshold (audiogram).